One of the difficulties with analysing fiscal policy is that the policy stance is relatively hard to measure (at least compared to monetary policy, where we can try to judge the effect of policy by looking at the policy rate*). We cannot look at the fiscal deficit, as it is driven by economic activity, and it is not under direct control of policymakers. (That is, it is endogenous, not exogenous.) For example, we cannot say that austerity policies were not implemented in the euro periphery just because fiscal deficits continue. This has also come up in the argument by Scott Sumner that "Keynesians" were wrong in their predictions about a recession in the United States in 2013. Scott Sumner in "The Keynesian shell game" charges that "Keynesian" economics was invalidated by the fact that there was no recession in 2013, despite a tightening of fiscal policy. (Scott Sumner is a prominent Market Monetarist.) Although the exact form of his challenge is questionable, this is an interesting topic for those of us who consider fiscal policy to be an important determinant for the economic cycle. Pick up any textbook and they'll tell you that Keynesian economics is about deficit spending [emphasis added - BR]. If you look at the official deficit figures you see an enormous drop in the deficit, from $1,087b in fiscal 2012 to only $680b in fiscal 2013. But it's even worse for the Keynesians. Fiscal years run from October 1st to September 30th. But the 2013 austerity did not begin until the sharp tax increases of January 1st 2013, 3 months into the 2013 fiscal year. I tried to estimate the deficit for the calendar 2013 from this source, and came up with $1061b in 2012 and only $561b in 2013, an astounding drop of $500 billion in just one year. That's austerity! Yes, the numbers that matter are the cyclically adjusted figures. But no one knows exactly where we are in the business cycle, and in any case the growth rate is not high enough relative to trend for the cyclically adjusted figures to be all that different from the unadjusted figures under any plausible corrections. I do not know what textbooks Sumner is referring to when he says that "Keynesian economics is about deficit spending." I picked up my handy copy of Marc Lavoie's Post-Keynesian Economics: New Foundations, and according to the index, and government deficits are only referred to on 16 pages out of 584. So presumably there is something more to (post-)Keynesian economics than just government deficits. It is very obvious that the fiscal deficit is not the most important economic variable for forecasting the cycle. What is the most watched economic data release? The United States Employment Situation Report (which includes the Nonfarm Payrolls Report). We could imagine the following situation. For the next year, the Nonfarm Payrolls number perks up, and the monthly average for the number of jobs created rises to around 300-350 thousand per month. (By way of comparison, the average in 2014 was 246 thousand per month.) What would happen? The bond market would get creamed. Economists would all revise up their growth forecasts. At the same time, since more people are working, and there would be presumably less people drawing unemployment benefits, the fiscal deficit would drop like a rock (the balance would become less negative). The previous observation can be explained away by the standard argument is that we cannot look at the raw fiscal deficit numbers, rather we need to look at "cyclically adjusted" deficits. The idea is that we can somehow adjust the fiscal data to take into account the pace of growth. Ideally, the smaller fiscal deficit that resulted from greater job creation will not affect the cyclically adjusted budget deficit. Sumner dismisses this argument on two grounds. the corrections typically are too small to explain the full drop in the deficit. Although I agree with those points, I would add that the concept is analytically useless. As I discuss below, there is no good way of doing this adjustment. There are a lot of moving parts in real-world fiscal policy. In order to understand what is going on, we have to ask how a model economy will work, and then hope to apply the principles to the real world. I have created a number of Stock-Flow Consistent (SFC) models for the analysis of fiscal policy (this post gives a list of primers and analysis). Stock-Flow Consistent models act as a modelling framework for broad post-Keynesian analysis; the hope is that the various schools of thought within post-Keynesian economics can have their principles translated into a SFC model. What is the average tax rate on personal income (dividends and wages)? How large are average unemployment benefits (as a percentage of market wages)? How many workers does the government hire (at the prevailing market wage)? How many units of "goods" does the government directly consumer? foreign trade and foreign holdings of financial assets. As an example, let us look at capital gains versus payroll taxes. Capital gains taxes hit households that have a lower propensity to spend out of their income than is the case for payroll taxes. Therefore, a 1% decrease in the deficit as a result of increased capital gains tax will have a smaller "multiplier" than 1% decrease in the deficit as a result of increased payrolls taxes. Since the same dollar amount of "shocks" do not have the same economic impact, it implies that the various components of fiscal policy are not fungible. Therefore we cannot conclude anything about fiscal policy just by looking at the fiscal balance. It is a sum of all the components, but they are not weighted by their impact on the economy. This is an unhappy state of affairs for economic forecasting. About all we can do is note the fact that fiscal policy settings currently change very slowly, so the previous year's mix is fairly close to this year's mix. Therefore, one may hope to patch together forecasts, based on extrapolating previous data as well as taking into account changes to the policy mix. And roughly speaking, that is a good description how market analysts look at fiscal policy. But this will not work in the case of radical changes, such as what happened around World War II. Looking at the 10-year yield, I think an analysis of a possible recession in 2015-6 is a much more pressing issue than what happened in 2013. Despite Scott Sumner's assertion about the "implosion" of Keynesian economics due to the non-recession in 2013, we could conclude little from one data point. Since there were cross-currents in the economy (fiscal tightening versus private sector investment and "loose monetary policy"), all we could say is that the calibration of some Keynesian models were incorrect. 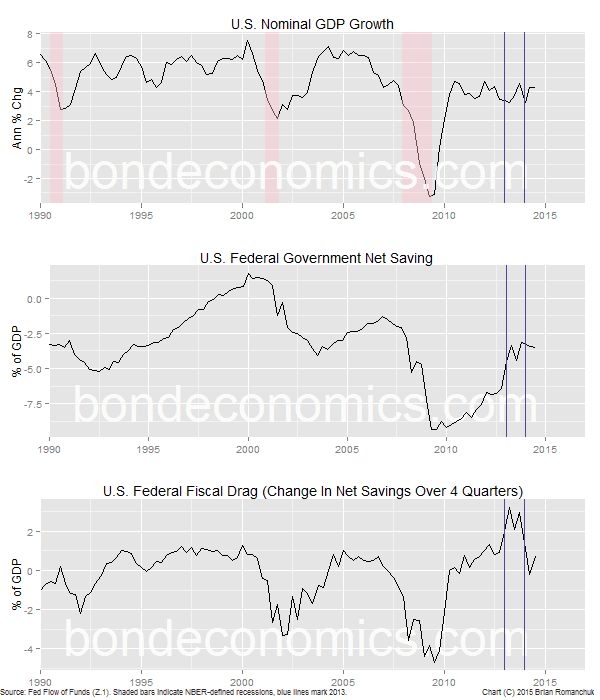 The middle panel shows a proxy for the fiscal deficit, Federal Government net savings. (The deficit is affected by accounting conventions, whereas net savings is a cash flow measure that will affect incomes in the other sectors of the economy.) The bottom panel is a rough proxy for "fiscal drag" - the change of net savings over four quarters. It hit an impressive 3% of GDP in 2013, whereas a 1% drag is more typical during an expansion. Also note that this "drag" includes the effect of the automatic stabilisers as well as policy mix changes. It would have been a more interesting situation if the change in policy was pro-cyclical, in which case any effect may have been more obvious. Despite this unusually large drag, the lack of a recession (as opposed to just slower GDP growth) is not too surprising because every recession since 1990 has been associated with an unsustainable investment boom; the recessions occurred when the investment was curtailed. This is easily explained by Minsky's Financial Instability Hypothesis, or Austrian malinvestment theories. The only schools of thought that have a difficult time explaining the instability of investment are mainstream "New Keynesian" economics and Monetarism. Since it is difficult to guess when an investment bubble will collapse, modern recessions are hard to forecast. There are a number of reasons why the economy was able to absorb the blow of tighter fiscal policy. Households smooth consumption, at least on a month-to-month basis, and so the sharp rise in payroll taxes in January 2013 will have been partially absorbed by savings dropping. Since the United States has a large trade deficit, the external sector partially absorbs the loss of demand. In the same way that monetarists/New Keynesians argue that discretionary fiscal policy is counter-acted by monetary policy, the "automatic stabilisers" of passive fiscal policy would counter-act the impact of the change in fiscal settings. Hiring decisions are fairly "smoothed", and so hiring and wage increases continued. The rise in the total wage bill overwhelmed the effect of higher taxes (chart below). Since the fiscal deficit only offers an incomplete picture of the fiscal stance, the lack of a recession in 2013 does not appear to be a massive threat to the validity of post-Keynesian economic thought. The instability of the business cycle is mainly associated with fixed investment, and that is endogenous to the private sector. This episode underlines the difficulty with fine-tuning the economy with discretionary fiscal policy, but I was already skeptical that the government can guide the economy with a high level of precision. As for Market Monetarism, I do not see the lack of recession as being grounds for a victory lap. One could ask why Japan has fallen into what appears to be a shallow recession when fiscal policy was tightened and monetary policy loosened ("Abenomics")? I do not follow Market Monetarism closely, as it seems difficult to use it to generate testable predictions. Moreover, I have explained why I think the Market Monetarist policy prescription - Nominal GDP Level Targeting - will not work in a previous article. * Monetarists have a theory that you cannot judge the stance of monetary policy by looking at the interest rate, you have to look at what is happening to the money supply (somehow). This looks like circular logic. The money supply is endogenous: it grows when the economy is growing in nominal terms. Therefore, growth in monetary aggregates tell us nothing about policy, unless you take the theoretically empty stance that all possible outcomes are the result of policy. ** In the long run, these models have a "Keynesian" property that they will reach a steady state growth path, and the steady state nominal GDP growth rate will be related to the growth rate of government spending. In this sense, fiscal expenditures "drive" the economy. However, it may take decades for the model to reach steady state, so this steady state condition can tell us nothing about what would happen on reasonable forecast horizons. "every recession since 1990 has been associated with an unsustainable investment boom; the recessions occurred when the investment was curtailed. This is easily explained by Minsky's Financial Instability Hypothesis, or Austrian malinvestment theories"
Have you written anything about Austrian theories? They seem like nonsense to me. They *sound* similar to theories that make sense, but are actually very different. This book review parallels what you say; "internet Austrian" thinking is fairly limited when compared to what the academic Austrians wrote. I do not get a lot of Austrian readers here, but there's quite a few on Seeking Alpha (where a lot of my articles reappear), so I did not want to provoke a fight by being too dismissive without having a justification.